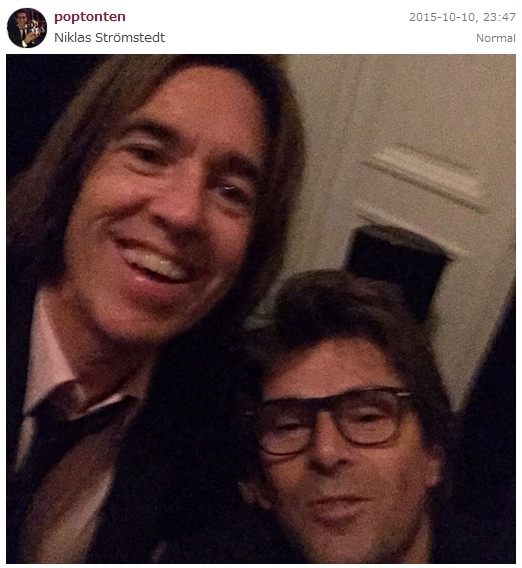 Per Gessle in Tack för musiken? Niklas Strömstedt posted a photo on his Instagram account some hours ago with this text: ”Tack för musiken…originalet. Stay tuned!” This is pure awesomeness! Marie Fredriksson was a guest of the show in 2013 and when Niklas had a Q&A session on AskFM on 21st January 2014, I asked him which part of Tack för musiken with Marie he liked the most and I couldn’t help asking the question if he was planning to invite Per in the future to his show. He said he liked it very much when Marie was singing Sparvöga and to the Q regarding Per he replied ”well…, we will see”. Then seeing the list of guests of the 2014 series I was a bit sad that Mr. G wasn’t there, but now this instapic of the guys looks very promising. The episode with Marie was incredibly fantastic. Read our summary of the show HERE. For that Tack för musiken we were able to apply for tickets to be in the audience and Marie was very happy to see some familiar faces in the front when the show was recorded in August 2013. Now it seems this option didn’t exist or at least we haven’t heard about it, because for sure there was an audience. It would have been cool to attend such a fab TV recording. If we are talking about it in past tense. But what if it’s a future happening? Fingers crossed! In 2013 the recordings happened in August-September and the first episodes were broadcast in December. It’s not yet published when the next series of Tack för musiken will be on air on Swedish TV, but hopefully, it is announced very soon and we can watch it still this year. It’s already too exciting to think about what songs Per will perform live and who will be his guests in the show. If it’s really a complete episode about him and he wasn’t ”just” a guest for some other artist. Haha. But no. That’s impossible. He surely has a complete show. Or is this pic about Tack för musiken, the show at all? Or was it a real music show Per and Niklas attended last night (Peter Jöback & Helen Sjöholm’s I Love Musicals maybe) and Niklas just commented the pic with “thanks for the music” referring to that event? Oh, well… Too many “or”-s and “if”-s. 😉 Looking forward to some more details, aren’t we?